Top: Labor Day Parade, 1909. Library of Congress. Bottom left: 122 Sullivan Street, 2nd Floor Rear, Leveroni Family, 1908. Library of Congress. 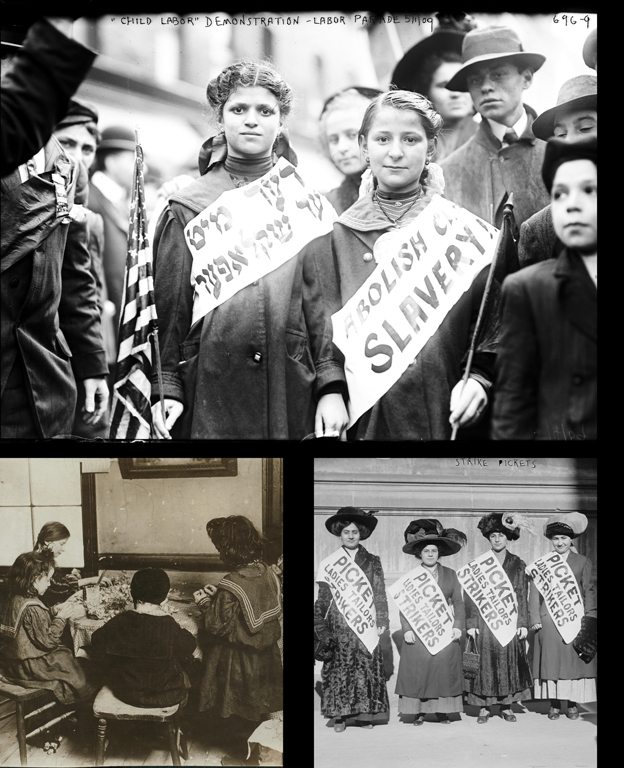 Bottom right: Strike Pickets, 1910. Library of Congress. The garment industry was especially attractive to immigrants since starting a small contractor's shop did not take much capital, and the number of workers would be small. Fluency in English was unnecessary. Eastern European Jewish immigrants were especially drawn to the garment industry. It is no exaggeration to state that New York's Garment District was created by Jewish builders, who primarily hired Jewish architects, who designed buildings that housed Jewish-owned businesses, and that employed, at least in the early years, a largely Jewish work force of men and women who belonged to a union dominated by Jewish labor leaders. The increasing production of ready-to-wear clothing coincided with the arrival in New York of large numbers of Jewish immigrants from Russia and Poland and, to a lesser extent, Italians, many of whom had been trained as tailors. Eastern European Jews rapidly came to dominate the industry at all levels, from the lowest paid sewing-machine operator to the owners of the most successful clothing firms. Indeed, most garment factories were owned by men who had toiled in sweatshops and saved their meager wages to invest in establishing their own factories. While many failed, others came to dominate the industry. Several manufacturers, notably Abraham Lefcourt and Abraham Bricken, became major developers of loft buildings. With the passage of restrictive laws in 1924 that limited the immigration from Eastern Europe, the makeup of the industry changed. Italian women joined the work force in increasing numbers, and by the 1940s and 1950s, large numbers of African-Americans and Puerto Ricans were employed. By the late 20th century, even as the number of factory workers declined, immigrants still dominated, but most were now Latin American and Asian.